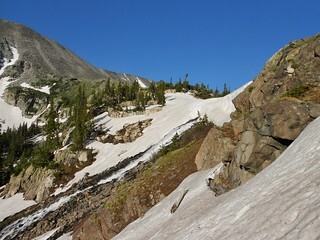 On Sunday, Doug and I drove up to the IPW to climb Navajo Peak. 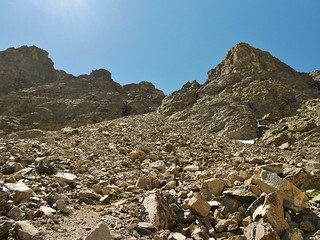 I was looking forward to the rock climb on Navajo Peak; a moderate route in a beautiful alpine setting. Also, there was the lure of Dicker’s Peck, a tower of rock standing in attention, just waiting to be climbed. 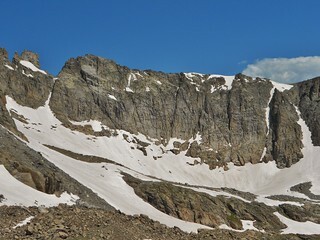 For a variety of reasons, we did not summit: Late start, poor health, poor route finding, bad weather, and crossing a boulder field while wearing crampons. I hyperextended my knee during the crampon bouldering section, and 6 weeks later, it’s still smarting. We hiked back to the car in a downpour, which just cemented our mutual feelings of utter failure. We vowed to “get it” next time. 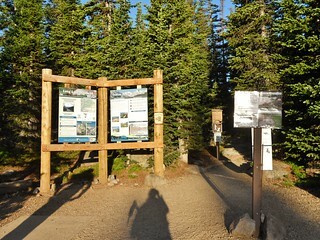 Long Lake TH, Departure time: 6:30am. This is too late…next time, I’ll leave the TH at 4:30am. Around 7:15am, we got off route. 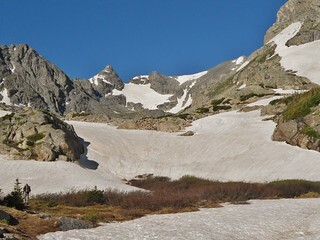 There were some switchbacks below a lake, but because of high snow levels, one of the switchbacks was covered in snow. So, we kept going straight and missed the turn. 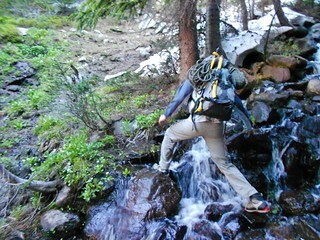 As a result, we ended up having to make two creek crossings and go up a 3rd class gully, to get up to the lake. The detour probably cost us 30 minutes of time. We are below the lake, trying to figure out a way up to the lake. There’s a huge waterfall gushing out from the snow bank! Our 3rd class ascent up a gully. Once we get to Long Lake, we take a quick snack break. It took us 1 hour and 20 minutes to reach the lake. We easily find the trail and make decent progress over the next hour. 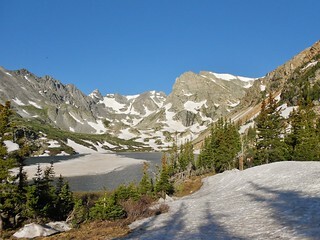 Now, we are above Long Lake and getting closer to the destination. We have a lot of ground to cover, as it’s 8:30am. With the high snow levels, it makes the going slower. 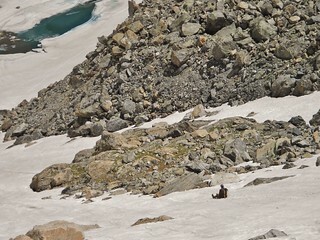 The next set of decisions is tricky…crampons or no crampons? 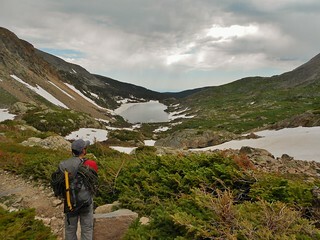 Break out the ice ax, or just use trekking poles? 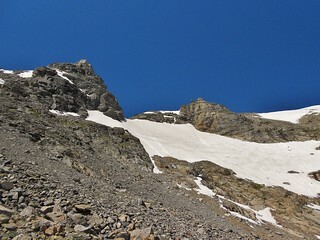 At one point, we looked over to the Isabelle Glacier and saw groups of climbers heading up Queen’s Way. 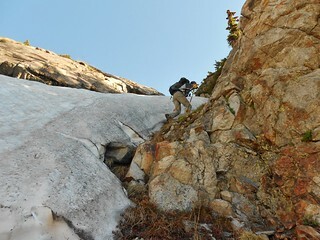 By the time we got to the base of the snow climb, leading up to the start of the rock climb, it was 10:45am. We stood there deliberating. Should we give it a shot, or not? Big puffy clouds started forming as we were discussing options. Finally, Doug admits he’s not feeling well. 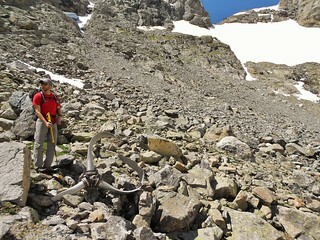 By this time, my knee is really starting to hurt, from hyperextending it on the boulder crossing. We decide to turn around, but before we do, I convince him that we should check out Airplane Gully. 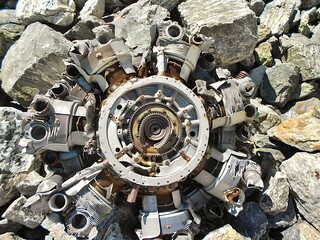 Doug and a wrecked propeller. 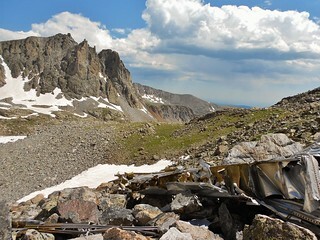 After a somber visit with the plane wreckage, with threatening weather looming, we start heading back to the car. Glissading was the highlight of the day. I actually had fun for a few minutes! 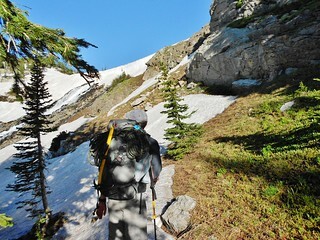 Descending to Long Lake, the weather finally hit us. Quickly, we add our rain layers and pick up the pace. Even though it was raining, the hike out wasn’t that bad. Our feet got a bit muddy, but the trail held up pretty well. I got this parting shot of Navajo Peak, in hopes for a good time on my next attempt! 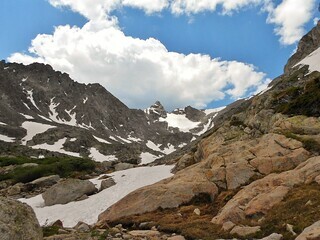 This entry was posted on Sunday, July 6th, 2014 at 1:58 pm and is filed under Mountaineering, Rock Climbing. You can follow any responses to this entry through the RSS 2.0 feed. Both comments and pings are currently closed.